It’s Leftovers Club Day! For new readers, Leftovers Club is a group of food bloggers who ship leftovers of their newest creation to a partner on the first Thursday of every month. I cannot express how exciting it is to get baked goods in the mail. Two of my partners from previous months mailed me variations of granola for our exchange. I am almost positive that before this club the only variety of granola I had was in bar form, so I became obsessed with it pretty fast. How could you not when you get to try this carrot cake version from Healthy Delicious and this Cherry Almond one from Carrie over at Frugal Foodie Mama? I was such a big fan that I decided to make my own this month for our club’s only male member, Dan from Platter Talk. 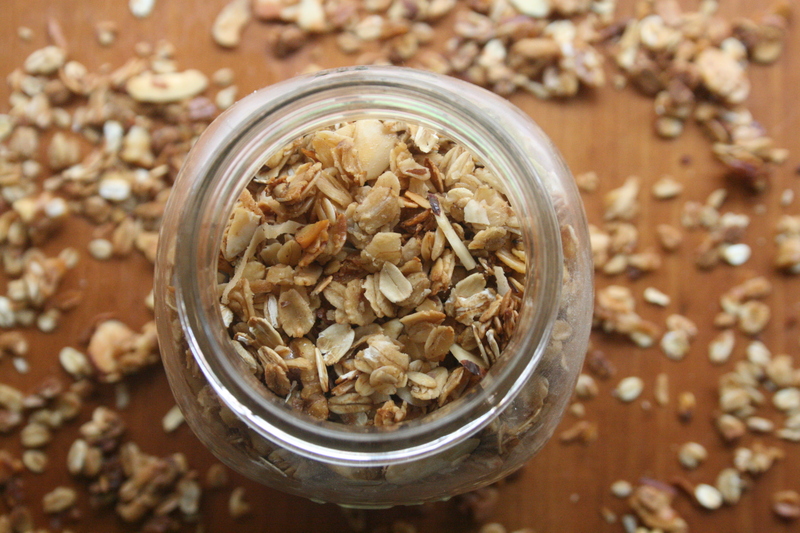 Making granola is incredibly easy. Now that I have discovered this, you should expect more recipes similar to this one in the near future. This version is pretty standard except for the fact that it includes three kinds of “nut” – walnut, almonds, and coconut. It also contains locally grown honey. Back in high school people used to tell me I should try honey for my severe allergies — if you eat a tablespoon each day of honey grown from where you live, it significantly reduces your allergies. I ignored the suggestion until last year, and when I finally gave in and tried it I couldn’t believe how much it relieved the agony I endure in the spring. Honey still isn’t my favorite thing, but I will do anything to not suffer from the allergy induced asthma that is my life. 1. Pre-heat the oven to 325 F and line a cookie sheet with parchment paper. 2. In a large bowl, mix together all the dry ingredients. 3. In a small saucepan, combine the butter, oil, honey, and syrup until the butter melts completely. 4. Pour the mixture onto the dry ingredients and toss until it is evenly coated. 5. Spread the new mixture evenly onto the cookie sheet. 6. Bake for 40 minutes, gently stirring the mixture halfway through. 7. Let cool completely and then transfer to airtight containers. This entry was posted in Breakfasts and tagged almonds, cinnamon, coconut, granola, healthy, honey, maple, walnuts. Bookmark the permalink. Feeling pretty lucky to be paired with you, this month!! Believe it or not, I have never had homemade granola, needless to say I am quite excited! Great job on the photos and rest of this post, it all looks wonderful!!! Yay! I’m glad you’re excited! I mailed out a mason jar full of it a few days ago, so be on the lookout! 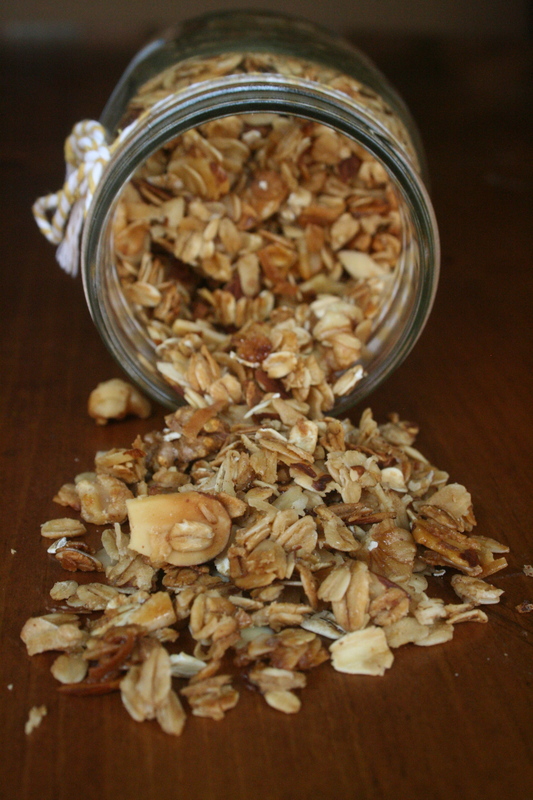 I really need to get on the homemade granola bandwagon! I’m a fan of anything cinnamon, so I’m loving this recipe! I love homemade granola and have never tried with this much cinnamon. Well, I love cinnamon so I am definitely bookmarking for the future!